Obama Calls Idea That The West Is At War With Islam 'An Ugly Lie' : The Two-Way The president told a summit on violent extremism that it's crucial to change the narrative about the intersection of religion, particularly Islam, and modern society. 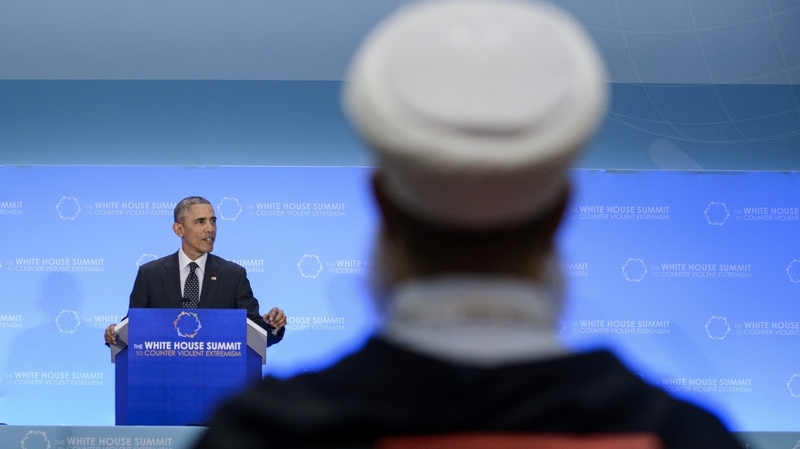 President Obama speaks to an audience of international leaders and religious figures Thursday at the White House Summit on Countering Violent Extremism, at the State Department. "The notion that the West is at war with Islam is an ugly lie and all of us — regardless of our faith — have a responsibility to reject it," President Obama said Thursday, at a summit on defusing violent extremism. The statement echoes the president's remarks from Wednesday, when Obama said it's crucial to change the narrative about the intersection of religion, particularly Islam, and modern society. He called it "a generational challenge," as Eyder reported for the Two-Way. Instead of focusing on Islam, the president and others have said at the summit, the U.S. and other countries should be trying to snip away at terrorism's ideological, economic and political roots. "Nations need to break the cycles of conflict — especially sectarian conflict — that are magnets for violent extremism." "We have to confront the warped ideologies espoused by terrorists like al-Qaida and ISIL, especially their attempts to use Islam to justify their violence." "When people, especially young people, feel entirely trapped in impoverished communities — where there is no order and no path for advancement, where there are no educational opportunities, where there are no ways to support families and no escape from injustice and the humiliations of corruption — that feeds instability and disorder, and makes those communities ripe for extremist recruitment." "We must acknowledge that groups like al-Qaida and ISIL are deliberately targeting their propaganda to Muslim communities, particularly Muslim youth. Muslim communities, including scholars and clerics, therefore have a responsibility to push back — not just on twisted interpretations of Islam, but also on the lie that we are somehow engaged in a clash of civilizations, that America and the West are somehow at war with Islam, or seek to suppress Muslims, or that we are the cause of every ill in the Middle East." Even before the U.S.-hosted Summit on Countering Violent Extremism began in Washington this week, the White House has been criticized for its position against using terms that directly link Islam or Muslims to terrorism. Last month, Politico's Rich Lowry complained of "a haze of euphemism and cowardice" in a January article about the White House's stance, written following the Charlie Hebdo attack in Paris. That prompted The New York Times' Thomas Friedman to write, "I am all for restraint on the issue, and would never hold every Muslim accountable for the acts of a few. But it is not good for us or the Muslim world to pretend that this spreading jihadist violence isn't coming out of their faith community." "Obama aides say there is a strategic logic to his vocabulary: Labeling noxious beliefs and mass murder as 'Islamic' would play right into the hands of terrorists who claim that the United States is at war with Islam itself. The last thing the president should do, they say, is imply that the United States lumps the world's 1.5 billion Muslims with vicious terrorist groups." Today, Obama said, "When people spew hatred towards others because of their faith or because they are immigrants, it feeds into terrorist narratives. If entire communities feel they can never become a full part of the society in which they reside, it feeds a cycle of fear and resentment — and a sense of injustice upon which extremists prey."